XICHANG, Dec. 8 (Xinhua) -- China's Chang'e-4 lunar probe was launched in the early hours of Saturday, and it is expected to make the first-ever soft landing on the far side of the moon. A Long March-3B rocket, carrying the probe including a lander and a rover, blasted off from the Xichang Satellite Launch Center in southwest China's Sichuan Province at 2:23 a.m., opening a new chapter in lunar exploration. "The soft landing and exploration of the far side, which has never been done before, will gain first-hand information about the terrain and lunar soil components and other scientific data, which will help enrich our understanding of the moon and the universe," said Zhang He, executive director of the Chang'e-4 probe project. The scientific tasks of the Chang'e-4 mission include low-frequency radio astronomical observation, surveying the terrain and landforms, detecting the mineral composition and shallow lunar surface structure, and measuring the neutron radiation and neutral atoms to study the environment on the far side of the moon, the China National Space Administration (CNSA) announced. Three scientific and technological experiments, designed by Chinese universities, will also be carried out during the mission. Nobody had ever seen the far side of the moon before the Soviet Union launched the Luna 3 probe in 1959, which was the first-ever mission to photograph the far side. The United States Apollo 8 mission sent three astronauts to fly around the moon in 1968, the first time that people saw the moon's far side with their own eyes. Remote-sensing images show the far side is thickly dotted with impact craters and has much fewer lunar mares than the near side. Scientists infer that the lunar crust on the far side is much thicker than the near side. But why so is still a mystery. "As no astronauts or rovers have ever landed on the far side, we know little about it except for speculation based on remote-sensing images," Zhang said. Astronomers are also seeking a completely quiet electromagnetic environment to detect the weak signals emitted from remote celestial bodies in deep space. The low-frequency radio astronomical observation will be one of the major scientific goals of the Chang'e-4 mission, said Zhang. However, landing and roving there requires a relay satellite to transmit signals. China launched the relay satellite "Queqiao", meaning Magpie Bridge, on May 21 to set up the communication link between the earth and the moon's far side. The satellite has successfully entered a halo orbit around the second Lagrangian (L2) point of the earth-moon system, about 455,000 km from the earth. It is the world's first communication satellite operating in that orbit, said Zhang Lihua, chief designer of the satellite from the China Academy of Space Technology. In orbit, the relay satellite can "see" both the earth and the far side of the moon. The earth's and moon's gravity balances the orbital motion of the satellite and makes it very fuel-efficient. 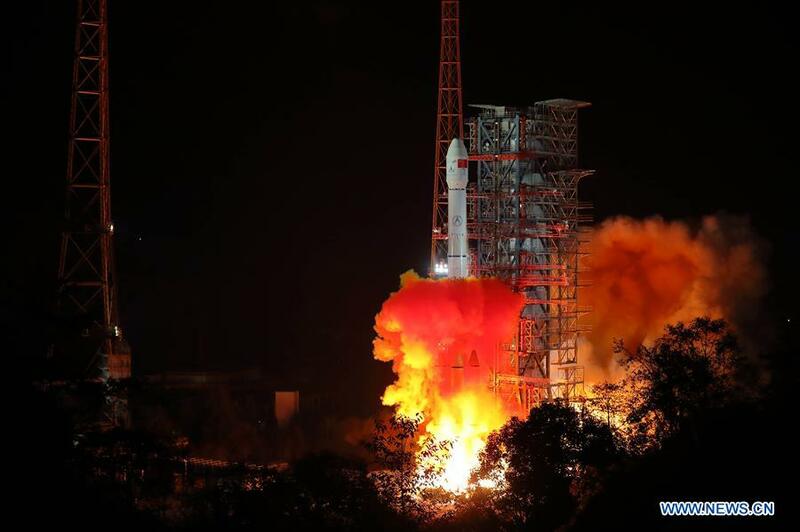 A test on the satellite in November showed that it is in good condition, said Zhang. Named after Chinese moon goddess "Chang'e", China's lunar exploration program, which began in 2004, includes orbiting and landing on the moon, and bringing samples back to earth. The country's first lunar probe, Chang'e-1, was launched in 2007, making China the fifth country to develop and launch a lunar probe on its own. After accomplishing its tasks, Chang'e-2 flew to the L2 point of the sun-earth system about 1.5 million km from earth to conduct scientific experiments. It was then tasked to fly by and observe the Toutatis asteroid, about 7 million km from the earth, and continued its journey into deep space. Chang'e-3, launched in 2013, was the first Chinese spacecraft to soft-land on and explore an extraterrestrial object. The scientific instruments on its lander are still operating, making Chang'e-3 the longest working man-made probe on the moon. China launched an experimental spacecraft in 2014 to test technologies to be used on Chang'e-5, which is expected to bring moon samples back to earth. The spacecraft re-entered the earth's atmosphere at a speed of about 11.2 km per second. The lunar program ushered in a new era for China to explore the universe and peaceful utilization of space.